A billionaire politician under investigation for corruption in Malaysia faces allegations his family companies have laundered millions of dollars through the Australian real estate market. The allegations against the family of Sarawak governor Taib Mahmud are contained in a report, obtained by Fairfax Media, by an anti-corruption organisation in Switzerland concerned with logging of rainforests in Borneo and displacement of its indigenous people. In its report, “The Adelaide Hilton Case – how a Malaysian politician’s family laundered $30 million in South Australia”, the Bruno Manser Fund (a Swiss non-government organisation) exposes the corporate connections behind Taib’s company Sitehost, which owns Adelaide’s $50 million Hilton Hotel. Major hotels chains like Hilton normally manage and lend their name to properties that are owned by other parties. Taib Mahmud was a Colombo Plan graduate of University of Adelaide and a substantial benefactor to his old alma mater. He was given an honorary doctorate and had a part of the campus named after him. The University has refused to say how much money it has received from Taib, although a spokesman said no donations has been received in the last eight years. 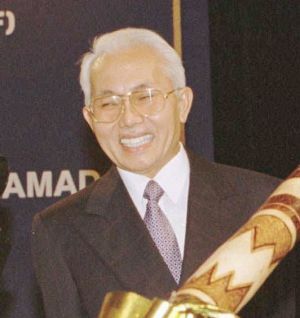 Sarawak chief minister Taib Mahmud pictured in 1996. 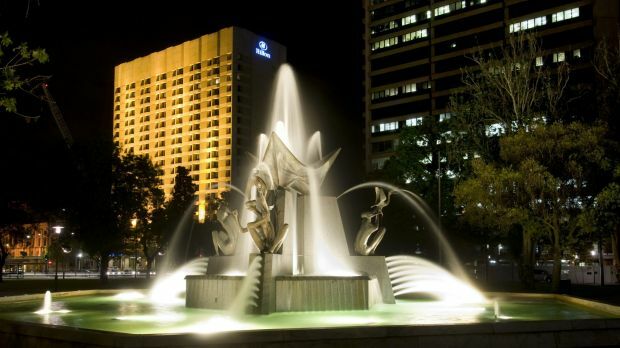 Taib’s family acquired the Adelaide Hilton site in the early 1990s. The Malaysian Anti-Corruption Commission (MACC) announced in June 2011 that the billionaire politician was under investigation for corruption. Under Taib’s governorship, nearly 90 per cent of Sarawak’s native rainforests have been logged. Despite his modest income as a politician, the family of Taib Mahmud has interests in more than 400 companies in 25 countries. The report questions how the Taib family could afford to finance the purchase of a major hotel. It also questions a key loan in the deal which totalled some $30 million in the early 1990s. Taib’s daughter and son-in-law became shareholders of an Australian company, Sitehost, after the family bought shares worth $9.5 million in 1993. The report says that when Sitehost acquired the Hilton hotel the following year, it took an unsecured loan of $20.75 million “from a non-bank lender whose identity remained undisclosed for over ten years”. Sitehost revealed in 2007 that the lender was Victorian company Golborne Pty Ltd. The report tracks how that loan was then transferred to another company, Fordland, located in Queensland. The last available financial accounts for Sitehost are from 2011 and show its main liability was a loan of $18.5 million to Fordland. The accounts describe a company with 361 employees, revenue of $1.3 million and assets of $52 million (primarily the Hilton). According to the report, there is strong circumstantial evidence, including a shadow structure on the Isle of Man, that Golborne Australia and Fordland Australia represented the same beneficial owners: the Taib family. Official records are lacking. As a large proprietary company, Sitehost is required to file annual financial statements with The Australian Securities & Investments Commission (ASIC). Its latest annual accounts however were filed in 2013 for the 2011 financial year. There were no accounts filed from the 1998 to 2006. Ernst & Young are the auditors and National Australia the banker. ASIC declined to say whether it had taken or intended to take any action in regards of the breaches. According to its most recent filings, Sitehost’s directors are Jamilah Taib (Taib Mahmud’s daughter), her Canadian husband Sean Murray – who lives in the second most expensive private residence in Ottawa – and two Australian lawyers, Gary Patrick Doherty and John Antoine Kiosoglous. Contacted by Fairfax Media, Gary Doherty said he did not know the source of the funds behind Golborne or Fordland. Doherty is a partner at the Sydney law firm Low Doherty & Stratford and a director of property development companies, one of which bears the name “Conceal Pty Ltd”. Doherty said there was “no subterfuge” in the name Conceal. “When you used to buy shelf companies they were always running out of names. The name was just a word that was there,” he said. The other local director of Sitehost, John Kiosoglous, was unavailable for comment. Questions were put to him via a third party. Doherty said he was aware of the money laundering allegations but had no involvement in money laundering. Nor did he know the source of the funds from Golborne or Fordland. There is no allegation that either director has been involved in money laundering. Besides the Taib family, with a 95 per cent holding, the other shareholder in Sitehost is a Guernsey company, not a British Virgin Islands company as disclosed to ASIC. “By indicating that Astar (this other shareholder with five per cent) is a Guernsey rather than a BVI company, Sitehost’s official shareholder information is clearly misleading and likely in breach of ASIC regulations. This might be interpreted as an attempt to conceal the real ownership of Sitehost,” says the report. Bruno Manser is calling on Australian authorities to investigate the Taib family interests, as the fund has already done in Canada and the UK. A representative Lukas Straumann has scheduled a press conference for 9.30am Wednesday at the Adelaide Hilton. 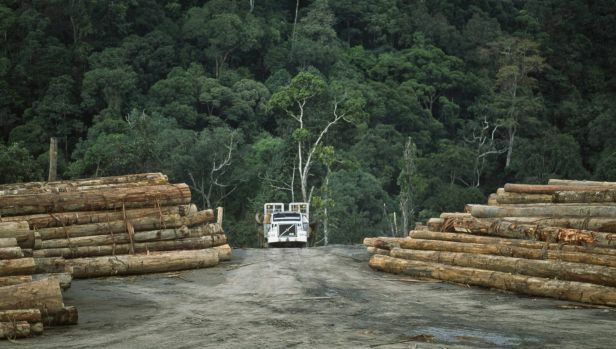 On Tuesday afternoon, South Australian MP Mark Parnell read out a motion in parliament expressing concern at the destruction of Malaysian rainforests and the connections between the Taib family, University of Adelaide and the Adelaide Hilton. He called on the South Australian to investigate the allegations. The motion is expected to be filed on Wednesday.